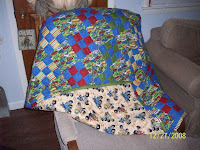 This is the quilt I made for my new grandson. It's not the typical "baby quilt" . I had a hard time deciding what theme to make for the little guy. His nursery theme is the classic Winnie the Pooh. The material I found in that pattern just didn't feel soft. So I went to my quilt store and asked for help.I told the girl that the baby's dad was a mechanic and loved to ride motorcycles/quads. So...she found 2 PERFECT prints and added the corresponding material to make this pattern. I was thrilled to see a tow truck in the one print. Max drives a tow truck . It's so "him"! I'm really happy with the finished quilt. It is something Jax will be able to use for awhile. Right now he's in the soft baby blankets but some day he's be old enough to use this one & it will grow with him. I know he won't take it with him to college but you never know :) I did make a couple extra blocks & want to make a small "taggie" blanket for little Jax to use now. I was with the other Barb when she bought these fabrics. Peggy, we were at QUILTING POSSIBILITIES and they were such a big help. Don't think it was Debbie, but one of her crew who did such a great job of helping. This quilt turned out great, and it truly is something little Jax will grow with!